Believe it or not, not all home movies were recorded using an iPhone. There are still quite a few camcorders and other video recording devices still being used to play back older home movies. Not to mention the fact that many among us have years of video clips on our hard drives that we would like to organize and view on our Apple TVs. Doing so may now be easier than you think. Apple added a new feature to the Apple TV this fall called iMovie Theater that makes viewing your home movies on your Apple TV a whole lot easier. Fortunately iMovie Theater is not limited to showing off movies that were recorded using Apple devices. 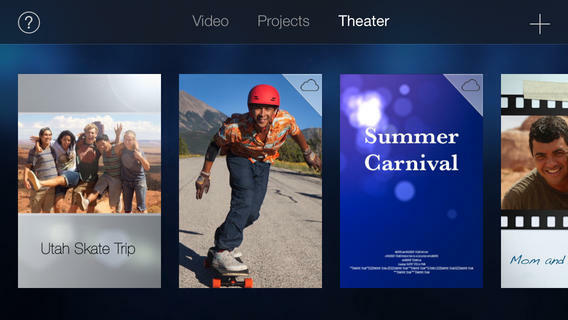 Almost any video source can be used and uploaded to the iMovie Theater. You do however have to go through either the iOS or the OS X version of iMovie to get there. Here’s how. The OS X version of iMovie still supports importing movies taken from tape based camcorders. Even if you are no longer using your ancient tape-based camcorder, it is refreshing to know that you can still access your old home movies from the latest version of iMovie. Once you do have your movie files on your Mac, all you need to do is just launch the latest version of iMovie for OS X Mavericks. By default, you don’t even need to modify your iCloud account settings to do this. If you are not interested in going through the process of importing your favorite movie events, starting a new project, trimming and transitioning your movie clips into the masterpiece it deserves to be, you don’t have too. You can bypass that entire process and use iMovie as a means to directly access your iMovie Theatre files stored in iCloud. Simply select the Theater tab of iMovie and drag and drop your individual movie files from the Finder directly to iCloud. iMovie will make all of the necessary transitions to support the various devices that have access to iMovie Theater for you. Within moments your video clip will be available on all of your Apple devices running iMovie, including your Apple TV. If the source of the movie clip is an iOS device, then your best path for getting your recorded movies onto your Apple TV is through the iMovie app from the iTunes app store. Unfortunately you cannot use the Photos app directly to access the iMovie Theatre, you must go through the iMovie app. 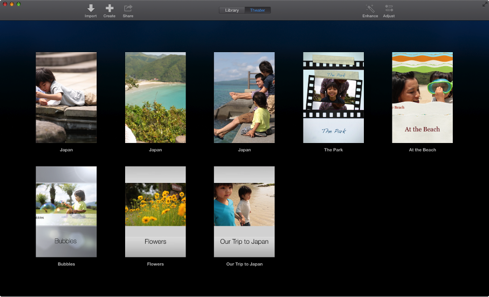 When you first launch the iMovie app, it will instantly find all of the movie files that you have taken on your device. There is no need to import. And just like with the iMovie app for OS X, you do not have to create a project or edit the movie file in any way to upload the movie clip into iMovie Theater. Simply select the clip and tap on the share icon. Choose iMovie Theater and shortly your movie clip will again be accessible from all of your Apple devices running iMovie, including your Apple TV. 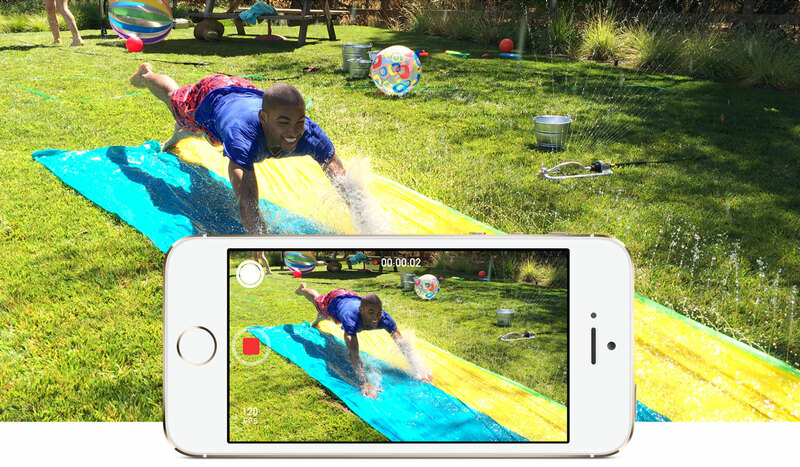 One of the fun new features of the new iPhone 5S is its ability to shoot high-definition video at 120 frames per second. This allows one to apply a slow motion effect to their videos to smoothly play back certain segments of the video at a more normal 30 frames per second. The challenge for many has been in preserving exactly which segment of the video is to play back in the slower 30 frames per second. The confusion stems from the fact that the Photos app is actually applying an effect to the video. Then when you share the video directly from within the Photos app, it will actually render the edited video with the applied effect before uploading it to the shared service you select. The problem with getting the edited version of the original movie into your iMovie Theater is that you cannot share directly from the Photo app on iOS to the iTheater: you must go through iMovie. The Photos app actually preserves the originally recorded movie file without alterations. So when you access the original video clip directly from within the iOS version of iMovie, or if you off load your videos to your Mac and access the original files using the OS X version of iMovie, you will notice that they are unedited versions of the movie without the slow motion effect being applied. One option you have is to simply re-apply the slow motion effect from within iMovie before sharing it to your iMovie Theater. Create a new movie project and add the desired movie clip to the project (import the movie file first if using the OS X version of iMovie). Split the video clip where you want the slow motion effect to begin, and again a second time where you want it to end. Select the clip in the middle and apply the slow motion effect to just that clip. There are advantages that this techniques has over jumping through hoops to try and get the edited version out of the Photos app in the first place. These alternatives involve sharing to alternate services first or emailing the movie clip to yourself. The first advantage is that you are working with the original movie file, not a rendered or edited copy. The second is that with iMovie, you can add multiple slow motion effects to a single video clip, not just one. That is something that the Photos app simply cannot do. The one downside to sharing your home movies to your iMovie Theater is that unlike Photo Stream, the shared movie clips stored in iCloud count against your iCloud file storage quota. If you are already backing up your iPhone and iPad to your iCloud account in addition to sharing app data with your Mac, you may be very close to using up your entire 5GB of free space. One option you have is to share the movie to your iCloud Photo Stream and access it from there. This does require a little bit of setup first in your iCloud account settings, and will use up local storage space on each of your devices. Additionally only the last 1,000 shared photos and videos of each Photo Stream will be accessible. That’s not exactly an option for providing access to some of your older, less viewed home movies. A second option utilizes your iTunes library. With it you can set up Home Sharing on your Mac to provide access to all of your home movies over your Wi-Fi network. To view the shared files you will need to set up Home Sharing on your iOS devices as well as your AppleTV. While each of these home movie to AppleTV sharing solution has their limitations, iMovie Theatre seems to be the easiest to use out of the box. A little late to the party but it appears that you have to be running OS X Mavericks for this to work. I have iMovie ’11 (9.09) on an early 2011 MBP running 10.8.4 and there is no Theater tab. Need OS X 10.9 to run iMovie 10.0 to import video to iCloud to have movies on aTV iMovie Theater. In the last section you mention “sharing the movie to your iCloud photo stream”. As far as I know, there’s no way to share a movie into the photo stream. The links you provide also say nothing about that. You must be running iOS 7. I have successfully shared videos from my iPhone 5S to my shared photo stream and watched them on my Apple TV. It was not possible before iOS 7. One more thing. In order to view shared movies on a shared photo stream you must also be running iOS 7. I was not able to view any of the shared videos on my shared photo stream on devices running previous versions of iOS. Hey are you having issues with netflix streaming and buffer problem ? I have apple tv 3. Nothing else has problems. Its wired connection. Tried macrumors for help and apple forums but no answers that solved solution. 1. Manually check for updates (settings). 2. Restart the Apple TV (located at the bottom of the general settings next to reset). 3. Log out and then back on to the affected account (be it Netflix, iCloud, iTunes or whatever). 4. Reset the Apple TV (located at the bottom of the general setting next to restart). Most of the time a simple restart (#2) solves the issue I may be having. In regard to Netflix in particular, I have experienced really really bad evenings where I simply could not play a movie no matter what I tried. Then the next day all was well again and everything worked just fine. This has not happened too many times, but it has happened to me. BTW, using the Remote app from Apple to enter in your account information is much, much easier than using the included IR remote.